Waiting in line is considered by some to be almost as bad as torture, but it’s one of life’s inevitabilities. But, what if there was a way to make airport queues move faster and keep the experience more pleasant for those in line? It all comes down to understanding why queuing is so painful, and doing something about it. No matter how carefully you have planned your business trip or vacation, from arriving early to check in, to paying that little extra for priority boarding, you can’t do anything about bottlenecks, delayed flights or other hold-ups. Next thing you know, you’re stuck between an irritated business traveller who’s worried about being late for a meeting, and a mother with three tired, cranky children who want to go home. And all you can do is stand there. Long lines are nothing new, but over the last twenty years, things have grown much more pressurised. With more security checks worldwide following 9-11, growth in passenger and flight numbers each year, and limited space to expand their existing infrastructure, modern airports frequently have to contend with lengthy queues of tired, frustrated people. Airports need to make sure there’s enough staff at various checkpoints, gauge the flow and number of people through the processes and concessions, preferably in real time, and deal with unforeseen events, like delays or serious weather conditions. Add to that the fact that, as passengers, we simply don’t care – it’s not our fault or problem. All of this puts the pressure on airports to revamp the way things are done and come up with better solutions. As a traveller, there are many frustrations you can experience, even before you get there. Traffic delays could mean you arrive feeling frustrated, and worried about missing your flight. Once there, there are all the queues you have to stand in – first check-in, then security, then the interminable queue for boarding, then the whole process in reverse when you land, with lengthy waits at border control, the baggage carousel and taxi rank. Most international airports have done what they can to minimise these lines, with self-check-in options, self-service bag drop, comfort-lounges, priority boarding and such, but that doesn’t eliminate the need to stand in line. If everything is running smoothly and at top efficiency, things will move reasonably quickly, but when things go wrong, it’s a recipe for extremely agitated passengers. Just one delayed or late-arriving flight can cause all planning to go completely out of whack. Suddenly, extra people need to be processed by a limited number of staff. Imagine you are one of the people waiting in an unending line, and only two counters are operating, while six, ten, fifteen counters stand unstaffed and inoperative – this leads to immediate irritation and complaints. Now imagine you have no idea how long this is going to take, and you’re constantly checking the time to see how long it’s been. Even if the queue is moving reasonably efficiently, not knowing how long things will take can be highly frustrating. The simple fact is, waiting in line with little to no information and no clear understanding of what’s going on can make you frustrated, angry and stressed, and it isn’t just you. Everyone in that queue is feeling the same pressure and for very good reasons. Plenty of research has been conducted on the psychology of lines, and most of that research says pretty much the same thing: most of the frustration people experience is caused by boredom and a lack of accurate information. In the case of boredom, having nothing to occupy your mind can make the wait feel much longer than it is. People have been shown to overestimate the length of time spent in a queue by around 36%, which means that boredom changes the way you perceive time. As for lack of accurate information, when people don’t know how long they can be expected to wait, their frustration immediately increases. They resort to guessing and hoping things will move quickly enough and are caught in a web of uncertainty. Add in the growing expectation of speedy service, which people have come to expect in the era of instant news, same-day deliveries, and 24-hour service centers, and now impatience has become just as important a factor. People are becoming less willing to wait quietly and patiently, and tend to complain sooner and more frequently than in recent years. Fortunately, the research has shown two very interesting conclusions. Firstly, by providing some form of distraction, airports can help reduce boredom. Secondly, by providing accurate, up-to-date wait-time information, they help travellers feel more in control, thanks to clear expectations. One of the major stumbling blocks to providing accurate wait-time information is how to gather that info accurately. By relying on CCTV cameras and a live monitor to try and accurately gauge where bottlenecks could happen, or where staff are needed to help speed things up, they are working reactively. Bottlenecks are only dealt with once they happen, rather than before they happen. At the same time, they can’t give reliable information about wait times. New technology, however, is taking the guesswork out of airport operations. All it takes is some strategically placed sensors and the ever-present mobile device. In contrast to the traditional cameras and human monitors used to gather data, mobile device-detecting sensors allow for real-time, seamless measurement of people flow. When using these methods, management can see, at a glance, where bottlenecks could occur, allowing them to quickly allocate staff to areas where they are needed. But how does it work? Quite simply, by understanding human behaviour. Mobile devices can be found in possession of just about every single person in an airport, and virtually all will have switched on their phone, or taken it out of flight mode, within moments of landing. It makes the mobile device a truly reliable indicator of how travellers are moving, queuing and using facilities. Don’t worry about your privacy being invaded, though – the system doesn’t identify you via your device; it simply recognises your device’s ID, which contains no personal information. Best of all, it allows the airport to give you the advantage of clear information, as well as faster, more efficient lines. By displaying real-time wait-time information clearly, these systems have helped reduce numbers of complaints, and even increased positive feedback about the passenger experience. Fortunately for today’s traveller, a SITA survey shows that to date, 42% of airports have invested in queue monitoring technology to give them a clear view of wait times at various pinch points. 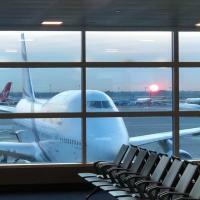 In 2015, Terminal 4 at JFK Airport in New York was much like all the other terminals – crowded with passengers, busy 24/7, with the tension and stress of national and international travel hovering in the air like a fog. Keen to improve the situation, they implemented a BlipTrack solution to help travellers get a realistic view of TSA and immigration queue times. “Nobody likes to wait in lines, and signage helps to manage expectations. Not only does it tell passengers how long they’re going to be standing around, but it also alerts employees about bottlenecks developing, which in turn allows them to react to the situation more quickly,” said Daryl Jameson, vice president at the company JFKIAT, which runs Terminal 4 at JFK. More or less at the same time, Cincinnati/Northern Kentucky International Airport (CVG) turned to the same solution to help reduce frustration and complaints resulting from people’s inaccurate perception of time. “Much of our interest in the public display of wait times was to dispel perception from reality. As the adage goes, ask five people what their actual wait time was, and you’ll get five different answers. Following deployment, complaints are now rare, as the passenger immediately understands the present situation and adapts,” says Brian Cobb, Vice president of Customer Experience at CVG Airport. Not only have CVG reduced wait-time complaints, but they’ve also been able to use the collected data to recommend TSA staffing adjustments, resulting in a reduction in processing times by one-third. Several other airports have followed suit, and have almost universally experienced a reduction in queue times, as well as complaints. The next time you travel by air, take the time to look around and see whether the airport you are in has invested in wait time displays to make your journey smoother, more efficient, and stress-free.